Every year, the Sacramento Stonewall Democratic Club holds a gala where we recognize local leaders who embody the goals of the club and of the Democratic Party – freedom from fear and want, freedom of expression, and freedom of worship. The idea comes from Franklin Roosevelt’s Annual Address to Congress in 1941. Check out our 2019 Four Freedoms Gala! 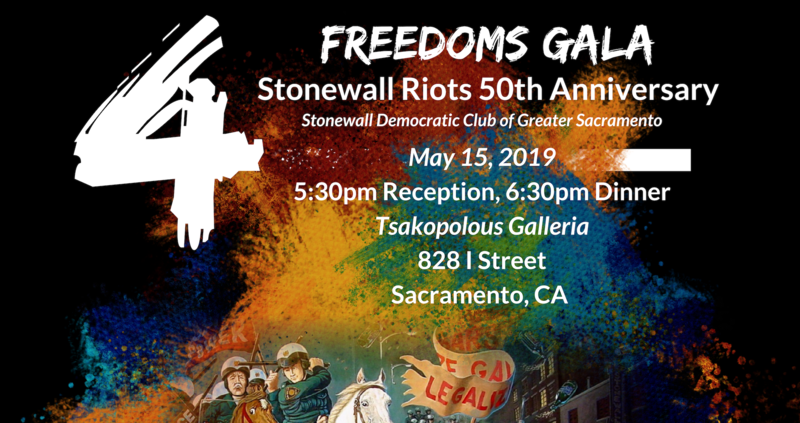 Join us for Sacramento Stonewall’s 16th Annual Four Freedoms Awards Dinner! The event will be held Wednesday May 15th at 5:30pm at the Tsakolpolous Galleria in downtown Sacramento. Date: Every 2nd Monday of the month! Social Time: After the meeting! Date: Every 1st Monday of the Month! Questions? Email our Communications Chair. Sign Up for emails, Like Us on Facebook, and Follow Us on Twitter to learn about alerts, events, and how to get involved. P.O.Box 161623 Sacramento CA 95816.